Sliders have slid right out of fashion, or hadn't you heard? I find trends, in general, rather tiresome. So, of course, the minute I hear that some food is cliché, passé and "so over," I have to whip up a batch! In or out, I like what I like. And I like small sandwiches. Whether you call them sliders or something else, if it's a delicious small sandwich, I want one! 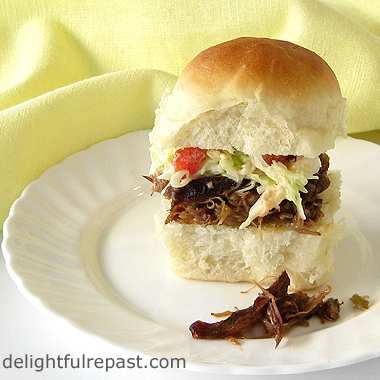 The slider (or small sandwich, if you prefer) pictured above is a Southern classic, pulled pork and tangy slaw. (A dozen people pronounced it delicious last Saturday!) I'll save those recipes for another day. (30 August 2012 update: I just posted my recipe for Pulled Pork.) Today we're making homemade slider rolls; they can also be used as small dinner rolls. If you're one of the more than 163 million viewers expected to tune in to the Super Bowl on Sunday, you're going to need some food! What could be better than a big tray full of Super Bowl Sliders--pulled pork or otherwise? Where do you stand on the issue of sliders? of food trends? of trends in general? 1 If your kitchen is cold and you want to speed up the rising time, preheat oven to 200 degrees. When oven reaches 200 degrees, turn it off. (If you have a really old pre-electronic ignition gas oven, just the heat from the pilot light will be sufficient.) Grease a 2-quart bowl* with 1/2 tablespoon of softened butter (for first rise). Grease 13x9x2-inch baking dish with 1/2 tablespoon of softened butter. *Using the straight-sided Pyrex 8-Cup Measuring Cup makes it easy to tell when dough has doubled. 3 In a large bowl, whisk together 3 cups flour, sugar, yeast and salt. Make a well in the center of the flour, then add water mixture and egg to the well. With dough whisk or large wooden spoon, slowly stir until soft, shaggy dough comes together. 4 Spread 1/4 cup of flour onto work surface, and reserve 1/4 cup to use as needed. Turn the dough out onto floured surface and knead for about 10 minutes, adding more flour as needed (to keep the dough from sticking to the surface), until the dough forms a smooth ball. Place smooth ball of dough in buttered bowl and turn to coat all sides of dough. Cover bowl with plastic wrap and place in turned-off oven until dough has doubled in size, about 1 hour. If the oven rack feels quite hot, put a potholder between it and the bowl. 5 Punch dough down (by pressing down in center and folding in edges), turn out on lightly floured surface. Divide the dough into 24 equal pieces by first dividing it into 4 equal pieces then rolling each piece into a thick log and cutting each log into 6 equal pieces. Keep dough pieces covered with plastic wrap or overturned bowl as you shape each piece into a ball by rolling it on the counter and between your palms. Place in 4 rows of 6 in buttered baking dish. Spray the same piece of plastic wrap with cooking spray, cover dish lightly and return to turned-off oven until rolls have doubled in size, about 1 hour. 6 Remove dish from oven and preheat oven to 375 degrees. Uncover rolls and bake for about 15 to 17 minutes, or until well browned. Remove from oven and cool on wire rack for 5 minutes. Keeping rolls together, remove rolls from baking dish and cool on wire rack for 2 hours. If not serving until later, return completely cooled rolls to the baking dish and cover with plastic or foil. Store at room temperature until later in the day or even the next day, whenever you're making the sliders. 7 Cut rolls in half horizontally and assemble sliders just before serving. Note: Oh, yeah, you'll need some dessert! Try my quick and easy feeds-a-crowd chocolate buttermilk sheet cake! I love sliders, and who cares if other people say they are out! What's good is good, and sometimes a big roll is too much. Your rolls look really yummy, and can be used for so many things! Thanks, Lana! I'm such a breadaholic, no roll is ever too big for ME! But I actually made these for a Southern themed afternoon tea, and I thought tiny sliders alongside the little tea sandwiches would be adorable. And they were! So, where do I turn myself in, breadless hands outstretched for the handcuffs? Love the pulled pork & slaw, but I can't tell you how many of those bread book-ends I've thrown away. Yup, quarter-pound cardiac burgers or sliders, matters not, I lift the top portion delicately between two fingers, scarf down the contents, maybe lick the sauce-soaked bottom wrapper a little,and drop that too onto the plate for discreet disposal. Mea culpa. Sully, I know exactly what you mean, which is precisely why I MAKE MY OWN buns! Commercial buns and breads of all sorts taste horrible; homemade tastes wonderful (which is why I'm a breadaholic)! Well you sent me to the chocolate cake recipe where I saw the Meyer Lemon cake recipe and that's where I landed from this recipe. 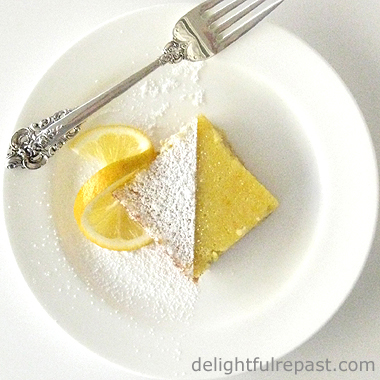 I love meyer lemons---and the cake looks incredible. Thanks, Jean! Thanks, Susan, I agree. I'm not that big a chocolate fan, would much rather have the Meyer lemon cake. But, above all, I'd rather have *bread*! Wow, you've really got the bread-making down pat - I remember your pull apart bread rolls from just before Christmas. These look fantastic. I wasn't aware "sliders" were out of fashion... We don't really have sliders in Europe (usually we just call it a sandwich as far as I know :D). Food trends - bah... if it tastes good, I'll eat it. Don't need some fashionista telling me that suddenly something is uncool and inedible and "90s"! We're a couple of rebels, Charles! Thanks! I do like to make bread. It's very relaxing to me. Kneading dough is like a meditation or something. These little guys looks awesome. You just can't go wrong with a bit of pulled pork. Thanks, Mike! Yes, do wait for warmer weather to start using your smoker. I really must get one of those someday! Malli, than you! I must say if a sandwich is made with good bread, the bread is *always* my favorite part of the sandwich! Sliders are still the "in thing" in our house, so bring it on!! Love pulled pork too! The buns look perfect! Thanks, Jenn! Yeah, what's "in" in our own house is what counts! Cauliflower Macaroni and Cheese - Sneaky, Huh?